Stuttaford Van Lines also offers storage facilities to businesses and individuals in South Africa. Our reliable and secure furniture storage solutions will take care of all your treasured belongings and attend to all your storage needs. Store your belongings with confidence! Whatever the size of your items, we can fulfill all your storage requirements. With our Classic Storage facility, our team will come to your home and handle the entire furniture storage process for you. This solution includes packing and loading your belongings at home before transporting and storing your goods safely within our warehouse. If you don’t have a big volume to store and you’re able to pack your own items, this option is perfect for you. 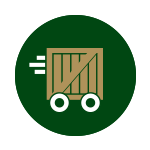 Once packed, you can bring your items to our storage warehouse and we will gladly store it safely at our secured premises. Our Portable Storage solution gives you greater freedom to pack your belongings at your own convenience. With Mobile Storage, we’ll deliver a plywood portable storage unit to your home which you can pack in your own time. Once the crate is fully packed, you can lock it with your own padlock, or purchase one from us, keep your key, and we’ll collect and transport the unit to our storage facility for safe storage. Do you know about our records Management services? Stuttaford Van Lines also offers archive and records management services. Stuttaford Van Lines assists companies all over South Africa with their physical and digital records management. Get in touch with our experts for a free quote! Pick the storage solution that fits your needs! Why Choose Stuttaford Van Lines Furniture Storage Facilities? 24/7 Security guards and surveillance cameras. We can build personalised crates for your big items. We create specialised packing materials for your biggest and most valuable items including vehicles, arts, piano, etc. Personalised moving boxes for your specific items. 5 000 square meters of storage facilities throughout South Africa. Up to 11 500 standard-size storage pallets. Expert staff with years of experience in removal management. Our staff is friendly and happy to assist. Enjoy the latest state-of-the-art computerised palletisation system to identify and manage your goods within seconds. How long can I store my furniture? You can store with us as long as you want. Our storage facilities are easily accessible, almost like a room in your home. Payment is monthly, and can be done with either a debit order or an EFT. Does Self-Storage mean I’m alone throughout the entire process? With Stuttaford Van Lines you are never alone. Even if you choose personalised storage, our staff are always happy to assist you and answer any questions you might have during the Furniture storage process. However if you need staff for a more personalised request, like packing or loading your furniture, you can make use of our optional extras. How many boxes and storage size will I need for my belongings? Your belongings are stored in 7 cubic meters pallet boxes which you can fill up, or ask for another pallet if needed. We have storage boxes in every shape and size. We can also build customised crates, for your special storage requirements to ensure all your belongings fit perfectly into the storage space. Do not hesitate to contact us for expert advice and a detailed price breakdown. What items are forbidden to store? Can I access my store unit whenever I want? Your store unit is available to access weekdays, 8am to 4pm. Call us to ensure that we prepare your unit and make it accessible before your arrival.